Wondering about your student’s admission chances and requirements of getting accepted into CSU? 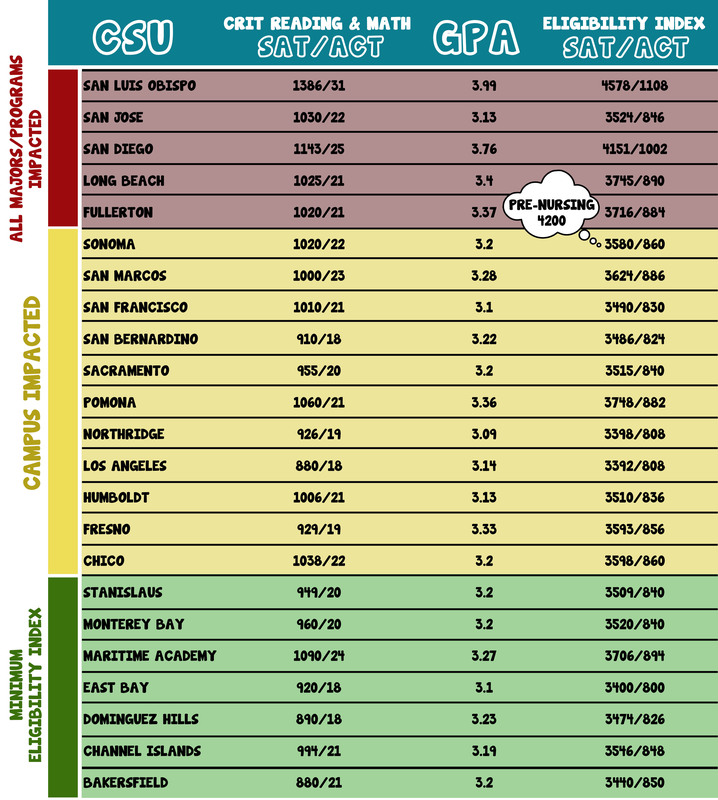 We’ll give you the CSU admission requirements run-down! Beware it is a bit confusing but we will do our best to break it up for you in 8 simple steps. If you want additional help please make sure to check out our college planning course by clicking here! All California State Universities have what’s called an Eligibility Index. This index is the initial criteria that allow incoming students to be eligible for any CSU admission. But meeting the minimum Eligibility Index score DOES NOT GUARANTEE your student’s admittance into some California State schools! So how do you know what you need? Here are some average acceptance scores for you. These three things add up to a score for a total Eligibility Index score. For any California State University to consider your student, they need to meet the minimum Eligibility Index scores for SAT or ACT. 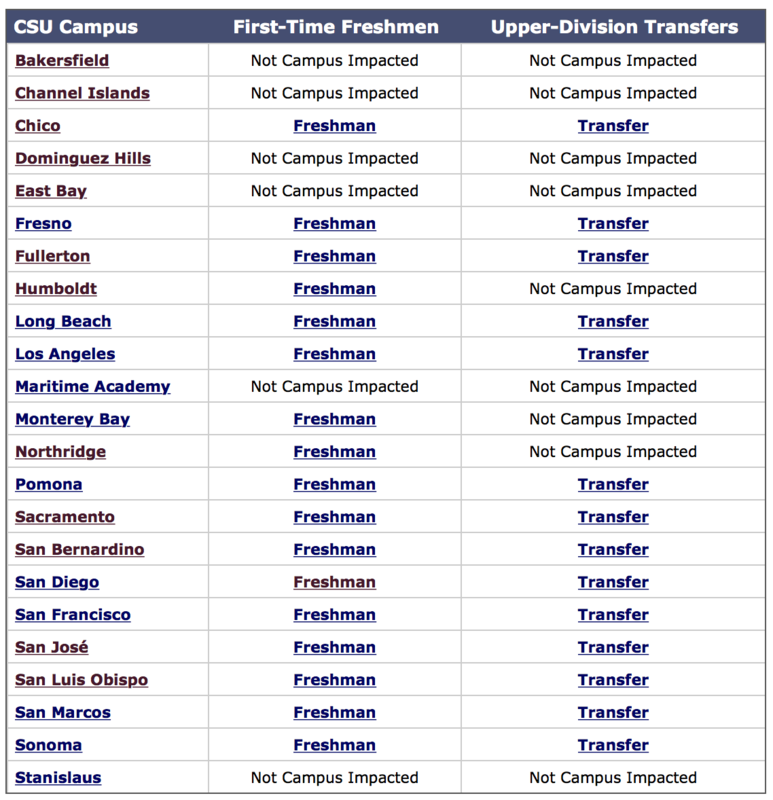 Click here to see your CSU Eligibility Index and determine if you meet the CSU admission requirements. Please note this will only tell you if you are eligible and not give you your actual score. Please note. This will only tell you if you are eligible and not give you your actual score. To determine your score, please follow the following formula below. Determine Your CSU Eligibility Index Score For Acceptance. Use the formula below to calculate your student’s eligibility index score. See how you stack against the average CSU acceptance scores for the CSU college you are interested in as shown in the chart above. There’s 2 formulas — one for SAT scores, and one for ACT scores! To make things even more interesting when you are calculating your CSU GPA it only takes your 10th & 11th GPA into account and only us a maximum of 2 AP/Honors classes from 10th grade. In step # 5 we explain how to calculate your CSU GPA in more detail. At this point you are probably realizing… you may need to read this article a couple times to fully grasp the CSU admission information. The A-G CSU Requirements are a minimum of 15 units. LISTEN UP! Many High Schools have courses that only last for one semester. If you want these courses to count toward your a-g CUS requirements, you need to take an additional semester of a class with the same classification. AND you need to get a C or better in every course! Therefore, even though CSU’s do not use your freshmen years GPA in the admission GPA calculation process you need to get at least a C in order to pass the A-G CSU admission requirements. Are there any exceptions? — Well, Hablo español? Sprechen sie deutsch? The idea is that you demonstrate a competency of the language that is equal to or higher than a student who has taken a language course for 2 years. Talk to the specific Cal State school you plan on attending for details on this. Every CSU university have slightly different admission requirements. Missing credits or have bad grades that don’t meet CSU admission requirements? Everything is easier when you’re academically on track. What happens when something goes wrong? Don’t stress out just yet! There are options for this. Take a course (or courses) in summer school. Take college-level courses that match the category needed for the CSU a-g requirements. Just when you thought it couldn’t get any more confusing… Impacted? What the heck does that mean? Ok, here’s the thing. Because the state colleges in California State Universities receive so many applicants for a given semester, their list of CSU applicants can exceed the maximum limits for students to be admitted. What does that mean? It means that so many people are applying to California State Universities that not everyone can fit. Because of this issue, certain majors for these schools become what are called Impacted majors. Impacted majors required CSU supplementary admission criteria. Sooo remember the different colored section on our chart of CSU Averages above? 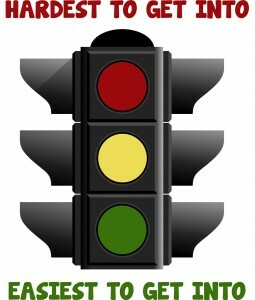 Think of it like a traffic light. Now check out the CSU impacted majors section. See how it’s in red? 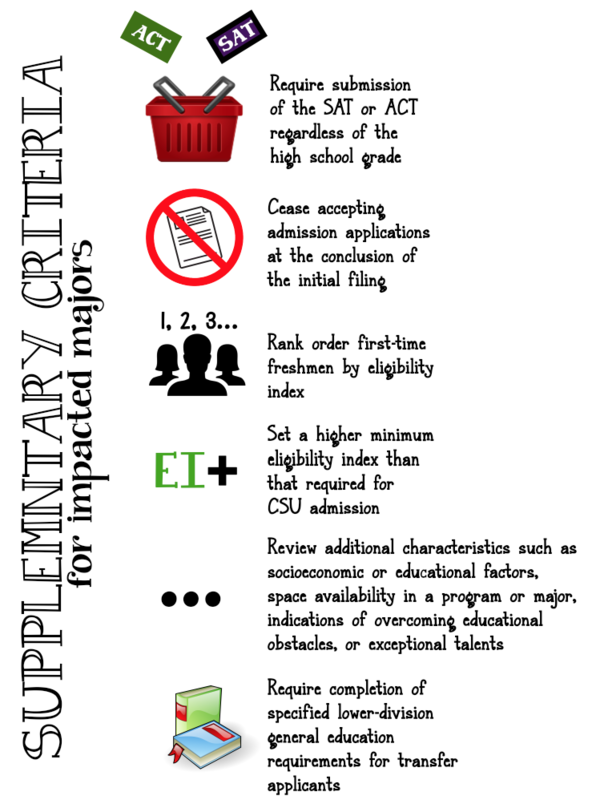 Here are some examples of supplementary admission criteria that impacted majors and programs can use. There is also what’s called Campus Impaction. There are some differences between an impacted major and an impacted campus. You can use CSU Mentor’s Admissions Application to reroute your application to another CSU in the event that you are not accepted. If your major is impacted, you may be admitted as Pre-Major Status. When you are admitted with Pre-Major Status, you are required to complete the Freshmen and Sophomore prerequisite courses for your specific major, prior to your CSU application. How do I know if my major is impacted? Check if your major is impacted using CSU Mentor’s Impaction Database. You can see here which campuses are impacted for State Colleges in California 2014-2015. Click here to see the most up to date! The GPAs used to apply for schools other non-UC/CSU schools are different from the UC/CSU GPAs. Just like the rest of this article probably confused you, this is going to confuse you even more! I will once again do my best in explaining this. First off CSU only uses your 10th grade & 11th grade GPA. This does not mean you can slack in 9th grade though because those classes still count toward your A-G requirements. 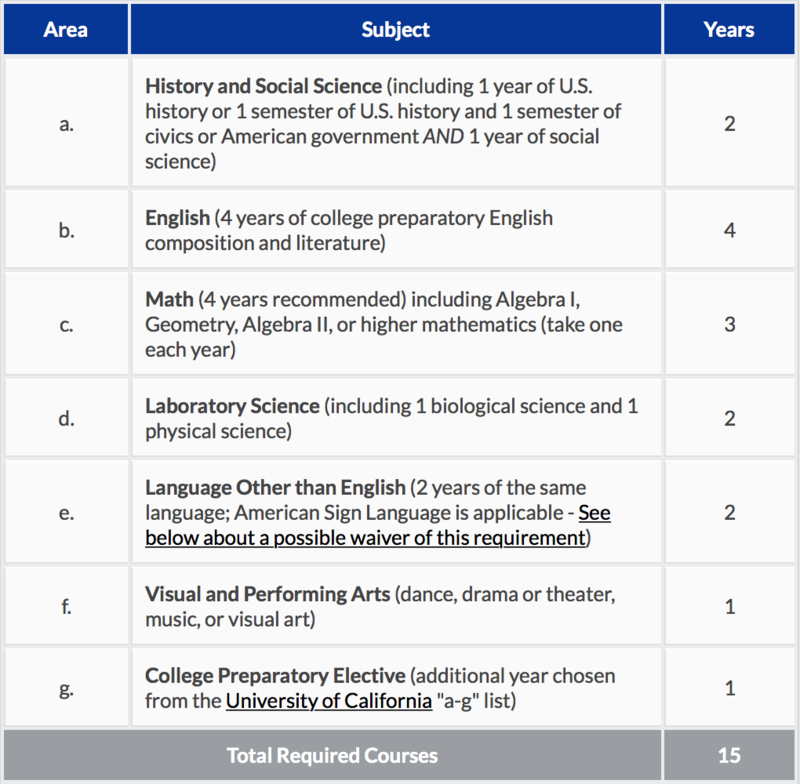 California State Universities will add up to 8 points from AP or Honors courses to your GPA, and plug it in to the Eligibility Index formula. You may only take 2 Honors/AP classes in the 10th grade to count toward your score. Some schools will vary on this. According to Humboldt State’s Admission Office, they don’t count any Honors courses for 10th grade, only AP! Click here to research GPA calculation and requirements via UC California admissions website. Alright, so which one is BETTER? Either test score will work for meeting your Eligibility Index requirements. If you have a chance of scoring higher on one, that would be the ideal choice. OR if you take one and do poorly, you can take the other to increase your chances. Like GPA, the idea is that you pay attention to the average score accepted by the CSU of your choice, and aim for that score or higher CSU admittance score. So technically, this isn’t part of the CSU application requirements. BUT if you want to take any classes, you’re going to need to pass your EPT. You want to make sure you’re prepared, because YOU CAN ONLY TAKE THE EPT ONCE. The exam costs $18, and will assess your level of reading and writing skill. Most exemptions from the CSU EPT require that you take a separate test. CSUMentor has developed an English Success Website, which offers various tools to prepare for the CSU EPT such as practice EPT tests. Just like the CSU EPT, this is required for enrollment in your courses! The difference is that the CSU ELM is meant to assess your level of math skill rather than reading and writing. $18 for this guy as well. That totals to $36 for both tests. Similar to the CSU EPT, most exemptions from the CSU ELM require a different form of exam. CSUMentor has a Math Success Website too! Take the CSU Early Start program, the summer before your Freshman year. Cal State schools want to make sure you are prepared for their level of coursework. Early Start is meant to help you reach that level of preparedness. How do I know if I need to take the Early Start program? When your CSU application is accepted, that CSU will notify you of how and where you can sign up. Step #8: Use your resources! There are people out there… people who can answer your questions. Like CSU Admissions Officers. And CSUMentor. And Student-Tutor. It’s important to remember that the criteria for CSU admissions and requirements is not concrete from year to year — It changes! Acceptance scores can stay the same, rise, or even lower from the previous year. CSUMentor is also a great resource for any general questions you have about CSU schools. They have tons of information that’s only a click away, and free. So did you get all of that? How many times did you have to re-read everything to full understand? Know your chances… what CSU wants what? Confused? What further clarification on this article and how to get into CSU. Believe me you are not the only one! Please comment below and let us help!